Next Post > Welcome, Worsted! The difference between a pile of yarn and the launching pad for your next creative masterpiece is color coordination. A thoughtfully-curated color palette will bring cohesion, beauty and sparkle to your project. One of my favorite projects this year was compiling an array of Palette wool samplers. From the lip-smacking juicy Candy Rainbow to the soothing neutrals of the Woodland Cabin, these color samplers will make your planning your next project a breeze (and more affordable, as the samplers are at 10% discount!). Whatever you choose, we think any project with these samplers will be beautiful! The samplers are lovely! What sorts of projects would you recommend for them? 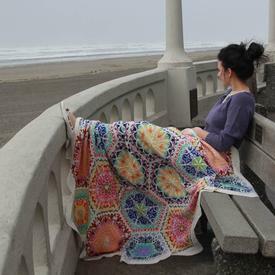 Kind of off-topic, but where is the Persian Dreams throw being photographed? It looks like such a lovely place!